When I click on All Apps there are empty file icons like that all over the place. My Windows 10 installation is an update over Windows 8. The SketchUp icon you see is from an application I installed after updating to Windows 10. 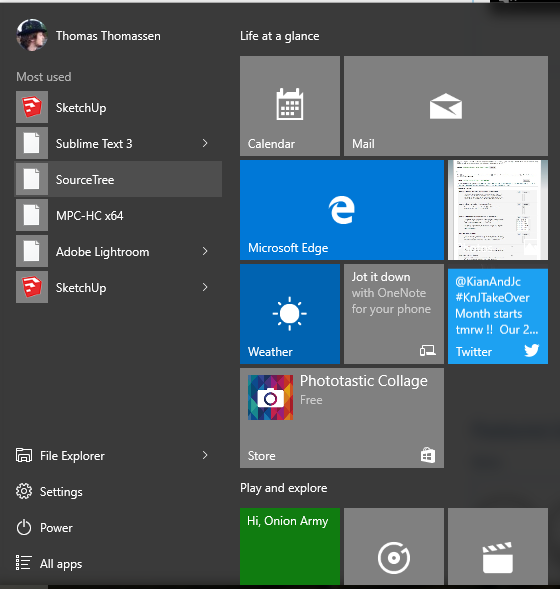 I know about Start10 - I used to use Start8 - however, I'm still trying out the native start menu and I'm trying to figure out what causes this. I updated on an old laptop of mine as well, dual boot - it had Win7 and Win8 - both are not Win10 and all the icons there are fine. I have IconPackage installed and repairing the icon cache has not worked. Now that Impulse is owned by GameStop - how do one download ones puchased StarDock products? Where can one set the tab alignment of a tabbed dock? Anyone knows of such an utility? I search around and only stumble upon desktop gadgets - or all too complex, bloated non-free utilities. I got CS5 installed. I added the suite's shortcuts to the dock. However, the PS icon isn't using the icon that belongs to ps.exe. For some reason it uses a custom one. Clicking Reset Icon doesn't work. Can I can't find a way to pick an icon that is part of an .exe file. All the other CS suite apps's icon display fine. My Thinkdesk subscription expired in september, I just noticed. But I wonder, is there any point renewing? I haven't been around WC that much the past few years, so I'm not up to speed with everything. What is the status of ThinkDesk? Are there new things to come for that package? And on the topic of Multiplicity, some years ago it was said a Mac version was worked on? Or was it linux? ... In any case, I have use for both. Has there been news on that? Has it been scrapped? At the moment I use Synercy to connect to my Mac and Linux box - which despite the lack of updates for years, works great. Probably the only reason I've stuck with MP for my windows machines is that I'd already bought it and the UI is a bit friendlier. Any news or summary would be nice. Could you please do this for me - just answer the very first that comes to your mind immediately. No pondering or looking up any references. IMPORTANT! Don't read the other's replies before you post! I don't want you getting affected by anyone else. There's one thing I've noted with tabbed dock across various systems and OS's. Tabbed docks takes a notiable longer time to load than normal docks. For my setup I have one normal dock with the most used applications. Quicklaunch soft of. Then I have a tabbed dock where I add the programs which I normally use in my workflow. I'm launching nearly every app from objectdock rather than the start menu as I find it so much more organized. However, then I start OD, which starts with Windows, the normal docks pops up immeidatly, while the tabbed dock takes much longer. I realise that at Windows startup lots of things is going on, but this behaciour also happens when I start OD manually after all the windows startup is all done. And it occurs on multiple system. So I was wondering is it's possible, or considered to improve on the tabbed docks load time?